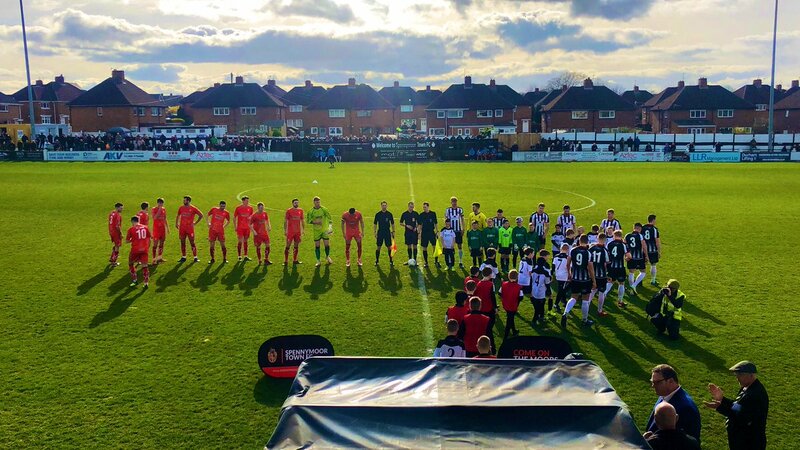 Jordan Sinnott's second half penalty secured a point at promotion hopefuls Spennymoor Town and in turn extended the Reds unbeaten league run to five games on Saturday. Billy Heath made three changes with Danny Clarke, David Lynch and Tom Platt coming into the side. Dec Bacon joined Tom Allan and Callum Chettle on the bench. The first half saw the hosts dominate the ball in the early stages with top scorer Glen Taylor a main threat for Moors, linking their attacking play as the hosts looked to work the flanks against us. We had an early chance through Bobby Johnson who was caught but his free kick came to nothing. Danny Clarke was then caught offside chasing a long ball from Jordan Sinnott this came after Danny hit a speculative effort on the half volley which went wide of the far post from outside the area. Sam Ramsbottom was called into action on nine minutes denying Harrison's shot. Taylor then came close with a rasping drive which went just wide. Communication at the back was an issue for Spenny in the first half with multiple balls forward causing panic between the centre backs and goalie Gould. Alfreton's best chance of the first half came to Sinnott who struck a stunning free kick from 25 yards which hit the bar and bounced back out, Richard Peniket raced on but could only force Gould to swipe away his header from a yard out with the goal gaping. With 22 minutes gone, Spennymoor took the lead when Glen Taylor turned into space on the edge of the box and hit a powerful effort into the bottom corner with Sam getting a big touch on the strike but the power took it in. The goal lifted the hosts who then hit the bar when Henry's header from Brogan's cross hit the top of the bar. Chandler then fired wide before Sam denied Hall in the box. The Reds were struggling with the patchy surface which led to us mis-placing passes and in turn soaking up pressure in the first half. A side from Sinnott's free kick we didn't create enough against the hosts but we approached half-time still in the contest. The last action of the half came when Josh Wilde was caught in the area after latching onto the ball first but the appeals were waved away as the first period ended. Alfreton came out of the traps quickly in the second half and dominated, Sinnott floated a free kick into the box which was cleared away for a corner but Sinnott over-hit the set piece. The Reds should have levelled after 49 minutes when Sinnott was found in acres of space from Peniket's cut back but Sinnott could only fire wide with the goal at his mercy. Bobby then tested Gould with a low effort which was saved. Sinnott curled a shot wide after wonderful build up on the right which saw Bobby break into the box and fed the Reds midfielder. Billy Heath then introduced Dec Bacon to the game and his impact was immediate as he broke the offside trap and found himself clean through, but Dec's effort was straight at Gould who saved from close range. The chances were coming and going for Alfreton who kept producing and kept creating but there certainly was pressure on the Reds to get the equaliser after these missed chances and another golden opening came when Tom Platt was taken down in the box after weaving his way through tackles. However we were not to be denied again as Sinnott stepped up and to the delight and relief of all, slammed the penalty down the middle to drag the Reds level in what was a deserved goal. Danny O'Brien was introduced and linked well with Bacon, Bacon then crossed for an unmarked Danny Clarke at the far post who could only head over the bar. Late on another picture-book save from Sam came as he palmed away Taylor's low effort with one hand in what was an outstanding stop from a rare Spennymoor attack in the second half. Alfreton settled for the point and produced another positive result against one of the promotion candidates; but certainly with chances created would have felt it should have been more. Never the less extended the unbeaten run in the league extends to five and next up we head to another top seven side in Bradford (Park Avenue) on Saturday, kick off is 3pm. ATFCXI: Ramsbottom, Clackstone, Wilde, Lynch (O'Brien 73), Shiels (c), Riley, Clarke, Johnson, Peniket (Bacon 64), Sinnott, Platt. Subs Not Used: Nicholson, Allan, Chettle.